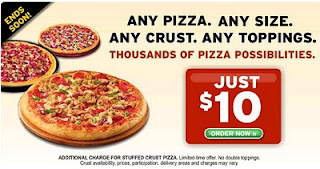 FeuerThoughts: Any pizza, any crust, any toppings, just $10? REALLY? "Why oh why can't everyone be as logical and straightforward and honest as a software programmer?" I couldn't agree more. It takes a special kind of mind (one might even say "weird mind") to be a software programmer. And that mind is very much insulted with things like the one you described. I'm also appalled by the lack of inconsistencies in some laws that are being passed by the government in my country (I live in Croatia). Because of that the laws are subject to different interpretations, which are sometimes exploited as loopholes. We programmers catch those inconsistencies at first glance. Why isn't that true for lawyers and politicians? And marketing people too. 1. You don't want everyone to be as logical as programmers. People's behavior is inconsistent and that is actually a good thing. 2. You don't want to make things overly programmatical, it is impossible to properly describe everything. Even if you could, it would be a horrible place. Blatant assumptions that we are all dumb is a good example. Where is the requirement for otherwise? The requirement is to maximize revenue from selling pizza's, right? Insulting smart people is just an unvoiced non-requirement. Irrelevant, even. Jimmy Carter was the closest thing we had to a programmer president, he was a nuclear engineer - are even programmers required to be that precise and logical? So why wasn't he our greatest president? Just relax, and quietly enjoy our superiority.